Growing up in Myanmar, the back of every newspaper had a section with big, bold letters that read, “BBC is lying, VOA is lying, RFA is lying; Sky full of lies”. The appearance of those words in newspapers, television, and books was stopped in 2010, when the government launched a series of political reforms. But, here I am in 2017, and I hear the same narrative that “the international media is lying” again. Surprisingly, this time, the narrative is being advanced not only by the military and the government, but also by the vast majority of Myanmar people, including even those who spent their whole lives in prison because they had called for democracy and human rights. The Rohingya exodus, one of the biggest humanitarian crises in the world, has inspired people to echo the narratives set by the military regime over the past few decades is. Following the attack by Arakan Rohingya Salvation Army (ARSA) on police outposts in August 25 2017, the military conducted a “clearance operation” in the area where the attack happened. As a result, over 700,000 Rohingya population had to flee to the neighboring country of Bangladesh. Rohingya are a marginalized Muslim minority who have lived in the West of the country for generations. According to the existing citizenship law passed in 1982, the government wiped out the citizenship of the majority Rohingya population, and the government and the public do not recognize them as an ethnic group of Myanmar since then. While much of the international community has recognized this incident as an organized human rights crime directed towards the Rohingya, the people in Myanmar do not see it as such. Most believe that the international community and the media are exaggerating the scale and intensity of the conflict. Unlike the old days when the state controlled all media channels, Myanmar people can now openly access all the media channels and the internet. However, the internet in Myanmar means “Facebook.” It is the platform for public engagement and information sharing. Policy makers implement policy based on information from Facebook. Many political commentators, activists, journalists, and the public use their personal Facebook to conduct political debate or to share opinions. This article is going to present three main narratives happening around the Facebook users in Myanmar related to Rohingya exodus. Though opinions on Facebook cannot represent the view of the whole Myanmar society completely, they can reflect views held by many. First, many Burmese believe that we need to be stabilized and united with the civilian government for a successful democratic transition. The elite community and the local media are the major producers of this first narrative. Myanmar is in the process of transition, and the military still holds immense power. The government is divided into the civilian branch and the military branch. The military, headed by the Commander in Chief, controls all the arms divisions and 25% of the seats in the Parliament. The Chief of Justice is the former military personnel. The civilian government, which came into power with a landslide majority vote, is headed by the President, but ruled by the Nobel Laureate Aung San Suu Kyi. As there is no proper democratic institution, Aung San Suu Kyi is an only hope for the transition for the Myanmar people. Therefore, the fact that the international pressure and criticism is rested on her crates huge push back from her supporters on Rohingya crisis. Second, many Burmese argue that the Rohingya are “ Islamic terrorists” and they are threatening the sovereignty of the country. The military, government, the nationalist organizations and public are the major producers of the second narrative. The front page of government-run newspapers and the Facebook pages of government officials discussed the Rohingya incident as “extremist terrorist attacks.” In anti-Rohingya protests, protesters used banners and vinyl’s stating, “wipe out the Bengali terrorists” and “We cannot accept the infringement of this union sovereignty and land looting battle of Bengali terrorists, totally rejecting the taking back of those treasonable Bengalis.” One significant example is a quote of Ko Ko Gyi in the New York Times: “We have been human-rights defenders for many years and suffered for a long time, but we are standing together on this issue because we need to support our national security”. He is the third prominent public leader who was jailed for 18 years for his political leadership under the military regime. Third, many Myanmar people believe that the Rohingya, the Muslims, are falsely trying to hijack the world’s sympathy. These narratives are wide-spread, but not limited to people inside Myanmar. The nationalist groups and the public are the major producers of the third narrative. Facebook posts, the interviews, and political cartoons convey the message that Islamic terror groups are attempting to invade Myanmar through the cover of Rohingya refugees asserting that the suffering of Rohingya is but fake. 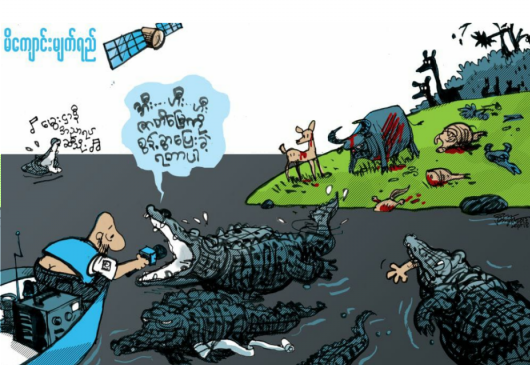 To represent this narrative prominent local cartoonists and activist drew a cartoon that titled “The Crocodile Tear.” These three narratives are changing overtime, and they sometimes overlap. It is noteworthy that there are some Burmese that speak out against the persecution and the assault on Rohingyas. However, their voices are not wide-spread as opposed to the dominant, negative narratives. For the international policy makers and the human rights advocates to solve Rohingya issue, it is important to understand these narratives of the Myanmar people. The conflict and tension is not only between the State and the Rohingya, but also between the Myanmar population and the Rohingya. The dignified and safe repatriation of Rohingya will be impossible if the general population is hostile towards them. Therefore, the international community should find a way to address the concerns of Myanmar population as expressed through these narratives. Eaint Thiri Thu has been working on issues related to human rights, conflict, and the media in her native country of Myanmar/Burma for the past seven years. As a fixer, research consultant, and producer, Eaint Thiri Thu has built up extensive experience with media organizations (BBC, New York Times) and non-governmental organizations (Human Rights Watch, National Democratic Institute). She is particularly interested in exploring how the concept of human rights is understood and practiced in conflict settings. She was awarded a Fulbright and U of M. Scholarship to pursue a Master of Human Rights.